Recipes, musings, and confusion of a baker who no longer has a bakeshop or kitchen to go to work at. Hey there anybody with an Insta-pot (as I call the Instant Pot) Or into getting creative with what’s in my freezer before moving. Resolution this year is to use all the meat in the freezer using this thing. And maybe this list will help me create a pop up supper club or start a business cooking and having people over. I’ve already made, Porridge, Megs Moist meat something. Both were made chicken. I’ve got another # of chicken breasts. Other items In freezer: (this is all 4 me) Email or comment @ me if you have an idea. I’m seriously thinking this is the way I will be able to make some $. I have the ability to make almost anything. raspberry coffee cake, apple crumble-just the crumbles, cookies dough, banana bread. And tonight I made Beef Bourguignon..aka Burgundy Beef aka Julia Child style with the instapot! 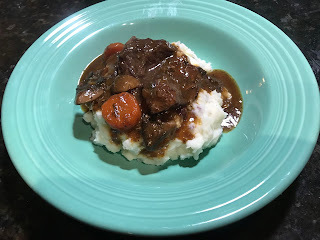 I got a couple recipe suggestions and settled on making Beef Bourguignon. I used the pearl onions which vanished in the cooking time. I pressed the Stew/meat option and let it go for 30 min after I sautéd 4 rough chopped slices of Nueskes bacon, then left the grease in the pot and browned the meat which was in almost 2” chunks The stew meat was already cut in the freezer and the mystery cut of meat went in as well, to make a filling 1 1/2 # dinner. the instant pot warned me it was Hot! But I pressed on and made it to the part to add 1 tb flour and salt and pepper, then the liquids and vegetables and set it to Stew/meat for 30 min. Followed 10 min of natural release and I then released the steam! I did look at a few recipes as I wanted carrots and a cooking style of stove then oven technique that this traditional recipe calls for, and my CIA background wouldn’t just let me ignore just bc it’s an Instant Pot. In a cheat move: I used a sauté pan to make the following and added it just before I served this with some mashed potatoes. So, skip the mixer and just use a big bowl to start this dough. Once you can get it into a lump, push it outta the bowl and knead it. Give it love! It'll taste better! Let rest for 10min after you give it a little stir. Get out your wooden spoon! Or just flick on your mixer..but its a small amount of dough, so your hook might not catch. Then turn into floured surface and knead this dough is like taffy. Set in lightly oiled bowl covered with a towel and let rise for 1 1/2-2 hrs until doubled. Invert a pan in a 500 degree oven. Punch dough down and turn back onto lightly floured surface. Divide the dough into 8 pieces(or 4 for giant pita!) shape into balls. Cover and let rest for 20 min. Roll out with rolling pin or old wine bottle into 7-inch circles. Slap onto inverted pan and bake until lightly puffed with a bit if browning in the edges. Wrap with a towel to keep warm. Mounds Bars for the masses! This recipe had margarine in it originally and comes from page 118 of the booklet, On the Corner. A Collection of Favorite Recipes from Katy's Korner tea room in Eureka Springs, Arkansas. Mix graham crackers, butter (melted), and sugar together. and press into a 9x12" pan. Bake 12-15 min at 350 degrees. Spread condensed milk, and coconut on baked crumb mixture and then sprinkle chocolate chips on top. Put back in over for 12 min or so then spread out the chocolate chips once you take the pan out of the oven.Cut into any size or shape once cool. Or get fancy and use cookie cutters. This is deliciously addictive. So maybe prep up another batch while you are getting the first one in the oven. It keeps tasty for 1 week, so store it in a Tupperware. It's been a while since I found a letter about who I can be that I wrote to myself for a school project. Maybe 10 years ago or more. Essentially,I told myself not to give up when it gets hard. But I've since misplaced that letter. This is the only part I remember most while working on creating a new food idea. I let this project die. It was just going to be unbelievably costly to even get a business going. But it was fun with the 4oz bags of dried organic fruit and the fruit flats made of only strawberry or raspberry or kale and then a banana. No apple as I notices the fruit roll ups everywhere used apple as their 1st ingredient. I even have a great dehydrator. Maybe I should have named it. It might have helped me to stick to this. I did go through a small incubator program here in Chicago and got my food handlers license and did some sampling at the Glenwood farmers market. So, next I will post some pics and who knows maybe I will name my dehydrator. You might try to make it with fattier nut or soy milks if you disagree with dairy. Good recipe. When its cooling, maybe save it in those nice little dessert bowls and stuff em in the fridge. Or, just put it in a pie pan to coolit, covered with plastic touching the surface. Bring 2 cups of water to a boil in a large heavy-bottomed pot (at least 3 quarts in size). Stir in the salt and rice. Cover and simmer over low heat, stirring once or twice, until the water has been almost completely absorbed – 15-20 minutes. Add the milk, half and half and sugar. Increase the heat to medium-high until mixture comes to a simmer; then reduce the heat to maintain the simmer. Cook, uncovered, stirring frequently, until the mixture begins to thicken – about 30 minutes. Reduce the heat to low and continue to cook, stirring every couple of minutes to prevent sticking and scorching, until a spoon is just able to stand up when placed in the pudding – about 15 minutes longer. Remove the pan from the heat and stir in the vanilla extract. Cool and serve at room temperature or chilled. I left the recipe as I found it online. Was credited to C.I. 1 stick unsalted butter, softened in tbsp pieces. Use a big pot when making this as it will foam and grow during the temp. Climb to 233 and again to 244. Cook hc, corn syrup and vanilla to 233 degrees over medium high flame, stirring occasionally. About 13 min. Don't be afraid to dump it all in a larger pot if the one you started with it about to overflow. Using a whisk, add softened butter and salt and cook to 244 degrees. About 7 min or so. Stir and stir with thermometer in the mix. When it hits 244, pour quickly into 9 x13 pan sprayed and then lined with parchment. Use overhang from the pan to pull out the carmel once it cools for no less than 4 hours. Cut into 1 inch squares using a sharp knife and wrap in waxed paper or parchment twisted at the ends. I use mine to make turtles! Grind these items for use in dishes with grains. Mix with things like: garlic, onion, ginger, fresh basil, oregano, butter and chicken stock. Fenugreek seed 1 1/2 tsp. Simmer again 5+ minutes, adding water if needed. Add 9 cans of coconut milk and boil on medium high heat. Good for use in Asian cooking. 1 New Mexico or California chili peppers. Stemmed and cut into several pieces. 1st, soak the chili peppers in hot water for about 15 minutes. Remove from water and set aside. Next, in a small skillet combine coriander, cumin and peppercorns and toss over medium heat until fragrant, about 5 minutes, stirring frequently. Cool and grind into a fine powder. Lastly, in a blender, put the rest of the ingredients and add the spice mixture. Puree until a smooth paste forms, about 3-5 minutes. Add 1/4 c. water to help the blending along. Sourced from a restaurant called Marnee Thai. I love making this when people come over and put out loads of spoons for people to taste it and put it on whatever is handy. Or just eat it by the spoonful, and it's just delicious. This was an item on the welcome buffet at the CIA's President house during my first week at school. They literally serve it off a "Spoon Tree." if I can ever describe this or make it I will, and post a photo here. Makes eight individual 1/2 c. ramekins and great for using up leftover, cooked corn on the cob. Tasty! But you can half the recipe if you don't have 4c. of corn. 4c. of cooked corn kernels. About 6 ears. DIVIDE! Preheat oven to 350 degrees and coat 8, 1/2c. ramekins with cooking spray or butter. cream, green onions, parmesan and eggs. Continue to process til smooth. Divide the mixture evenly amongst the 8 ramekins set in baking pan that is large enough to hold all 8. Add hot water to the pan so that it reaches halfway up the sides of the ramekins. Best to do this step once you got the pan in the oven. I suggest you use a tea kettle to make it easier. Bake 45 min or so until tops are golden in color and firm to the touch. Remove from oven and carefully take ramekins out of the pan using tongs. Best if served warm, not hot hot hot! Brine, Marinade and Dressing o my! It has a good flavor and holds well. Refrigerate after whirring it up in a food processor and you're done! Boil all these ingredients together for 5-7 min. Boil, for only 5-7 min. cool then strain. Submerge Pork Chops for 45 minutes then grill baby grill. Marinate a whole cut-up chicken for 1-2 hours. Bake at 350 degrees for 40-50 minutes, turning and basting occasionally with marinade. Serve with rice or eat all by itself for a tasty meal that can be made for a fancy party dish. I post my recipes here so I have them everywhere.